Recently, I’ve gotten a number of emails and/or comments from many of you inquiring about my journey to become a certified personal trainer. First off, I love hearing about all of your stories and your curiosity about the field of personal training. It seems like there’s quite a few of you out there who are finding yourselves in a pair of shoes very similar to mine! Secondly, I want to thank all of you, again, for each and every kind comment, message, tweet, and email regarding my new adventure. I do get nervous sometimes (especially when I’m trying to remember all of those damn muscles from chapter 4) about whether or not I’m going to be able to remember it all, what I’m going to do once I finally finish studying, and whether or not I’ll even be a good personal trainer. Luckily, all of you seem to come in at exactly the right time, to give me that little confidence boost that I need. So, in case I haven’t already said it enough, you guys rock. Like, a lot. When I was first deciding whether or not this was the path I wanted to take, I did a little research at the local gyms in my area to see which certifications were most widely accepted. After inquiring both at gyms and with some others of you out there, I finally decided to get my certification through NASM. I initially set a goal of about two months to complete my studying and take the exam, but I’m thinking that it will probably be closer to three. Considering the fact that my education background included absolutely zero anatomy and/or science, I still have a lot to learn in that area. And honestly, this part of the material is just plain hard for me. If there’s anything that I may have missed, or you have any other questions about any of the personal training stuff, just ask! Good choice with NASM. Besides an exercise science degree it is the most respected in the fitness community IMHO. Science is hard, but once you truly "get it" you can understand why thinks work the way they do..and you can explain to your clients in "lay-mans" (is that the word?) terms the logic behind the fitness principles you teach. You have such a varied fitness background that you'll do great. Do you want to do one-on-one training or more class teaching? I'm so excited for you about your personal training "journey" :)! You will absolutely fabulous! And, you are totally going to be able to remember all of the muscles. I've taken anatomy twice now and trust me, it's not as hard to remember as you think it will be! My bf is certified through NASM too and he thinks it's been great! He's also working a lot right now and people LOVE the stuff he does with them! They've even switched other from other trainers to him :). I have the Grape flavor Crystal Light Pure right now. I like it! The only thing is, I wish they didn't have 2 servings per packet, not only is it difficult to get the right amount, but then your left with half an open packet. I get that stuff all over the place! Glad to see everything is going well on your journey to becoming a PT! :) I repeat meals quite a bit! Breakfast is my easiest "rut" to get stuck in! I have been trying to switch it up a bit more lately. I wasn't a fan of the grape flavor as much, but I did like the tropical blend I got. I'm terrible with water-drinking and sweetening it makes me guzzle it. I probably have a bigger sweet tooth than you some days! Haha! I try not to repeat meals, but we have some backup plans in case I don't feel like doing anything creative. Also, Scott likes to demand taco night often, so I try to keep that stocked. I've been slacking though. That's so awesome that you're following your dreams and becoming a personal trainer. It's definitely a secret dream of mine and I'm glad I have some more info in case I decide to make it a reality one day! I'm excited for you and your personal training journey. :) I'm sure you'll do great. 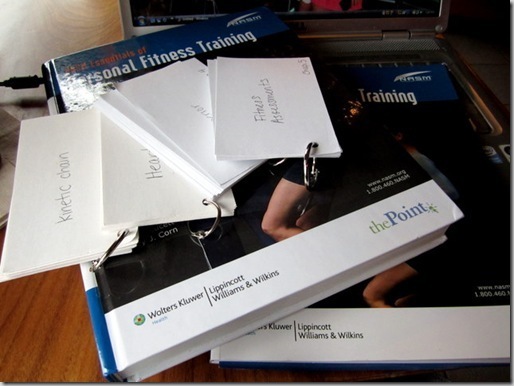 I loved NASM...I felt like it was the most thorough and informative about every aspect of personal training. I really liked how they incorporated so much program design in there too. ACSM and a couple others are REALLY science based...I believe even moreso than NASM. I feel like NASM gives you enough, but not too much of it. I actually remember asking you why you chose NASM on Twitter a little while ago, haha ;) ) I'm planning on getting certified sometime within the next year, so your input was much appreciated! I'm actually between NASM and AFAA because I heard good things about both, but we shall see.. I've always thought being a personal trainer would be a perfect fit for me and maybe someday it'll be a good option for me. Good luck to you on your journey. You're going to be great. I usually at a bowl of roasted veggies every night, but the main disk is always different. I don't mind repeating meals if it's dinner and then lunch, but not back to back dinners. Not sure why. I love that you're posting more about your journey to becoming a Personal Trainer! Can't wait to hear and read more. Also, I'm definitely a creature of habit when it comes to lunch time meal-making routine. It seems like everyday I stuff my belly with veggies (aka a salad) thinking this is probably the best time to pack them all in. I need to think outside the box and try some new lunch ideas. I am SUCH a creature of habit - I'm with you on "why mess with a good thing?" I also like to make big batches of cooked veggies and grains on Sundays to toss together for my week's lunches so they inevitably end up looking a wee bit similar! I am so excited for the potential cupcake-decorating vid! Your cupcakes always look ahhmazing and mine look like a car backed over them. Courtney, will the webinar be recorded? I live in Australia and will be at work when it is on! I tossed around the idea of being a personal trainer before going for group fitness instead. Although it's still in the back of my mind! I admire you for going after what you really want to do! I Think that is what everyone should do, I just wish I could take my own advice. Good luck with your studying! I repeat meals pretty frequently! You and Julie both had spaghettie squash tonight - twins! I think three months is the minimal to really study and prepare for that test. So. Many. Details!! I am coming up on my fourth now myself! Hi, I just discovered your blog and love it. I can't wait to read more. I also just started studying to become a CPT through NASM, so I have the same textbook. It's a lot of work, and I have no prior science classes either. Good luck and I can't wait to read more! One of the reasons I don't post my meals is because I'd bore my readers with my repeated meals! Some would call it a rut, I would say I'm going with what I know what works :)! When I was studying for my diploma to become a certified nutrition consultant, the science part got to me too- was so tricky remembering everything, all the nitty gritty! First of all, thank you so much for the webinar last night! I learned a ton and totally admire you (and all of the other fine, classy ladies!). I repeat my meals a lot. I have a salad for lunch every. single. day. This can be boring to some but I love to mix up my dressings and toppings. I just vary what I have alongside the salad. Works for me. :-) I'm so excited that you're doing all of these personal training Q&As! When I graduate from college, I will be a certified nutritionist and would love to couple that with being a certified personal trainer. Your path totally inspires me because I know it is possible (with hard work, of course) to continue blogging while doing all of these amazing things. I'm so glad to have you there! Thank you sooooo much for listening in! 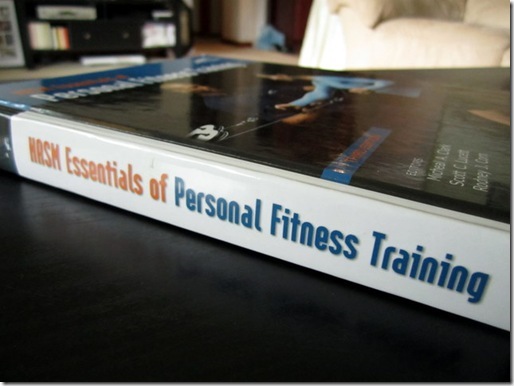 I have been thinking about personal training as a career path as well. I love hearing your thoughts and opinions about it. When doing research did you hear anything about the ACE certification? Was that one recommended to you at all? The person I contacted at my local gym suggested that one. Just wanted to know if you heard anything about it! By the looks of the other comments on here it seems as though everyone agrees with the program you are going through! I did hear some very good info about ACE as well. It was actually the first one I was considering! I think its great that you are getting your personal training certification! I have thought about getting the NSCA certification, but unsure if i want to be in a gym setting 8 hours a day lol.. I graduated with nutrition degree and struggled through anatomy - feel your pain! Where can you find Garden Vegetable Hommus you eat? I have never seen it spelled that way but it is the same as hummus? Good luck with studying.. You will do great! I am certified through NASM, and just actually sent in my re-cert for another 2 years. woo! I chose my CEU's in Weight Management, and OPT for the Prenatal client. It was alot easier than the CPT test, and was done at home. If there is one thing I can tell you, it's to memorize the ftiness assessment chart(what to stretch, strengthen, names of the muscles, and whether they over/under active) Alot of the questions used the proper muscle names, so if you are not familer with terms "Biceps Femoris" for Hamstrings, or "Sternocleidomastoid" for a muscle in the neck, figure out a way to memorize each group and no that chart by heart. You only have 3 months to take the test, and you need your CPR/AED cert also, so make sure to get that if you haven't already. Goodluck!